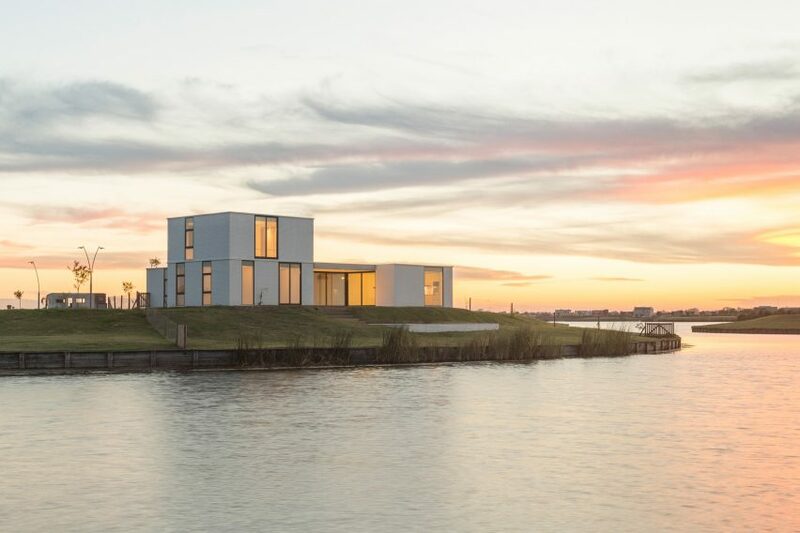 Numerous design elements help reduce energy costs in this home by Argentinian studio BHY Arquitectos that overlooks a lake in a new development. 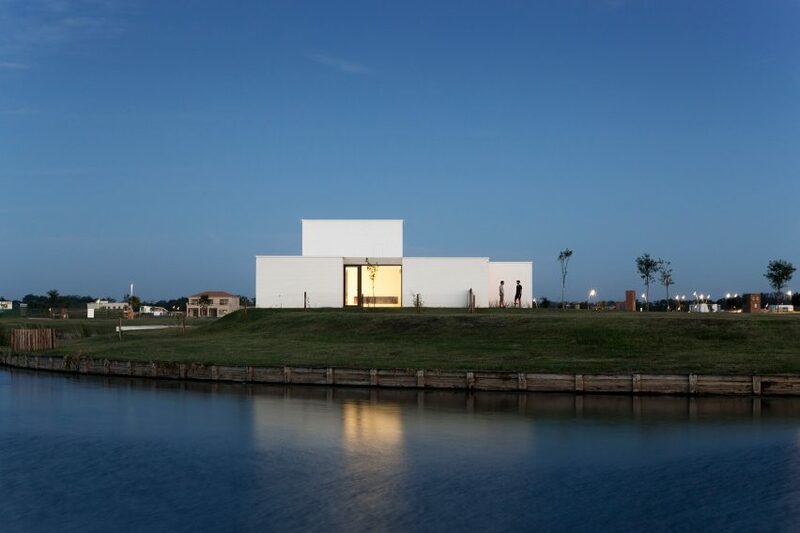 The project, called Casa Lucia, is located on a waterfront site in Puertos Escobar – a planned development on the northern fringe of Buenos Aires. 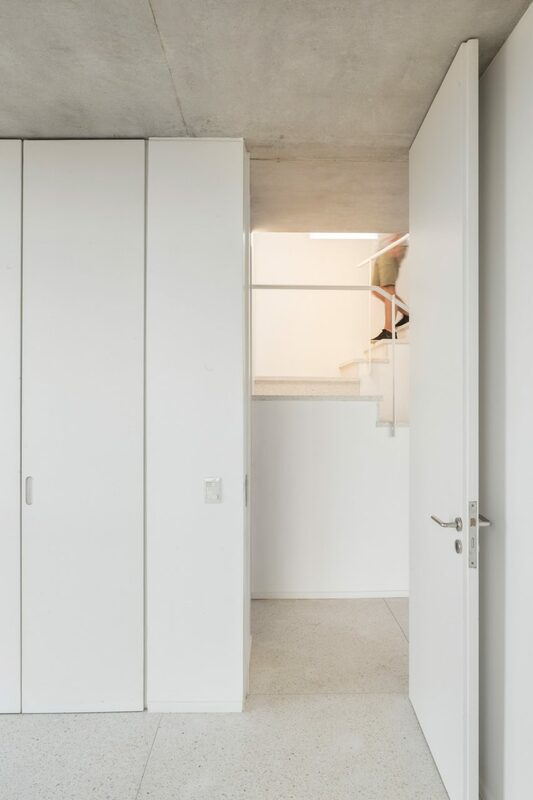 The austere “resting house” was designed for a client with two children. Composed of crisp box-shaped forms, the two-storey dwelling sits on a wide open property that is blanketed with grass and speckled with young skinny trees. Creating a dwelling that was highly responsive to the site conditions was a primary concern for the architects. The team incorporated several passive strategies to help reduce the need for air conditioning during the summer, and heating during the winter. 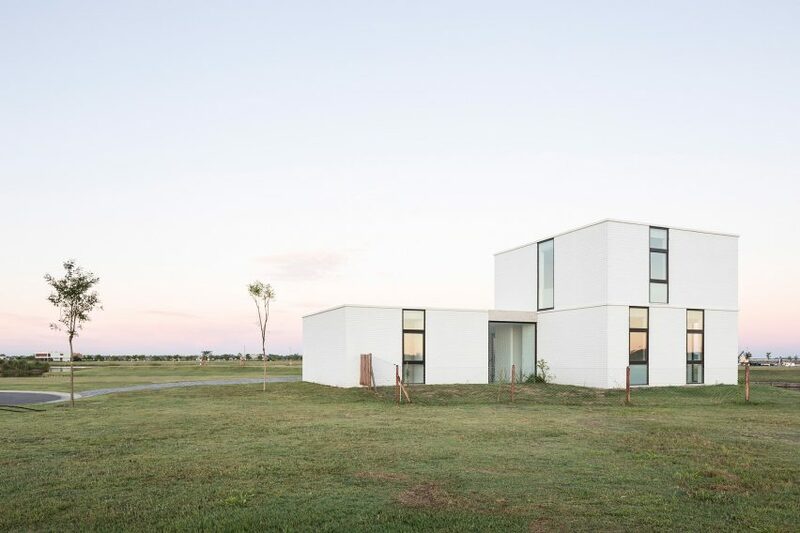 “It is located according to the open geometry of the plot, respecting the required setbacks and optimising solar access, views and programmatic links,” said local studio BHY Arquitectos. 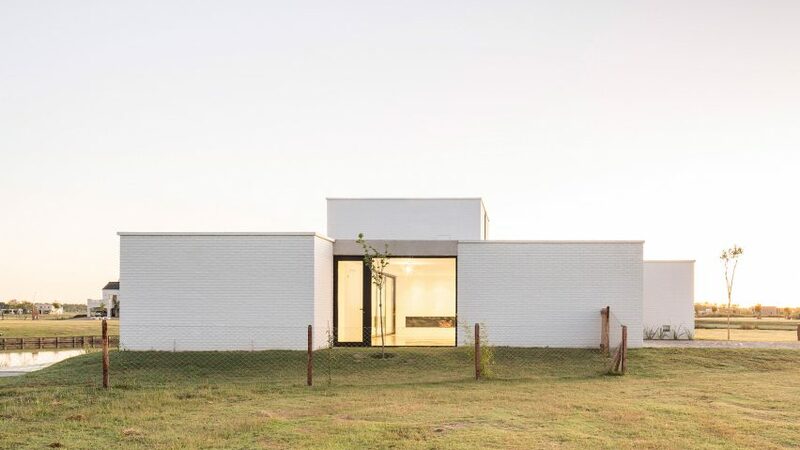 The envelope consists of double brick walls that were painted white, which helps reflect direct solar rays. 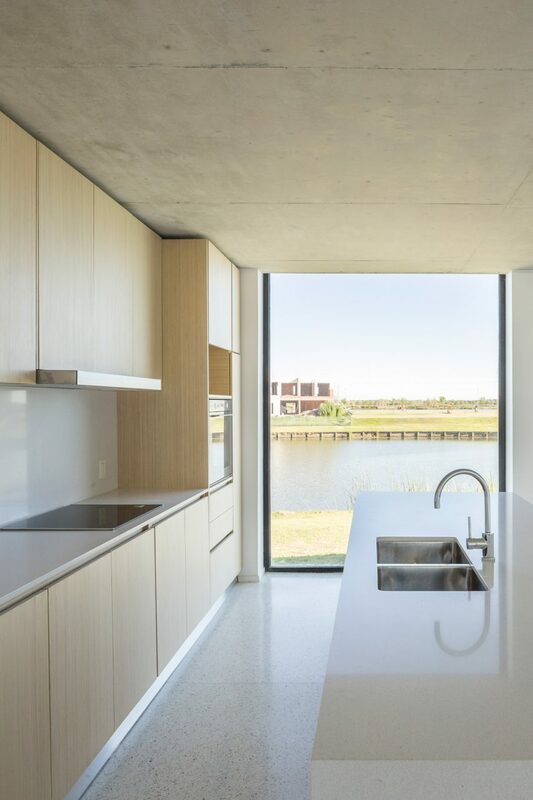 Floor-to-ceiling, double-glazed windows bring in natural light while offering views of the vast sky and the tranquil setting. The positioning of the windows enables cross-ventilation within the dwelling. On the exterior, the windows are framed in black aluminium, providing a sharp contrast with the all-white facades. A cobblestone driveway leads to the garage and the front door. Inside, the team created four distinct volumes “to structure the space”, each with its own specific function. Moreover, the volumes have been arranged in a way that keeps the centre of the home shaded. In the middle of the dwelling, an open zone is intended to serve as a living room and dining area. Cut into one of the interior walls is a long black strip containing a fireplace and wood store. On the north side of the room, a retractable glass wall opens onto a covered patio overlooking the water. “The free space in between the volumes holds a direct connection with the exterior landscape and features without hierarchy the social program of the dwelling,” the team said. In addition to the open area, the ground level contains a kitchen and three bedrooms. A simple, white staircase leads up to the second level, where the team placed the master suite. A restrained material palette was employed throughout the home, including teak wood and polished terrazzo flooring. Brick walls are left visible, visually drawing a connection to the exterior facades. The ceilings are clad in exposed concrete that was cast in-situ using plywood formwork. 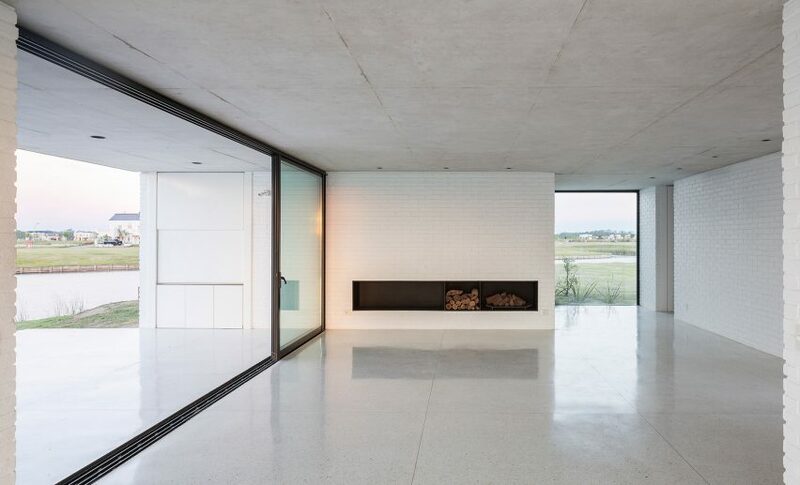 “The exposed concrete has great thermal mass capacity, which in this particular climate allows for an increase of passive thermal comfort,” the team explained. 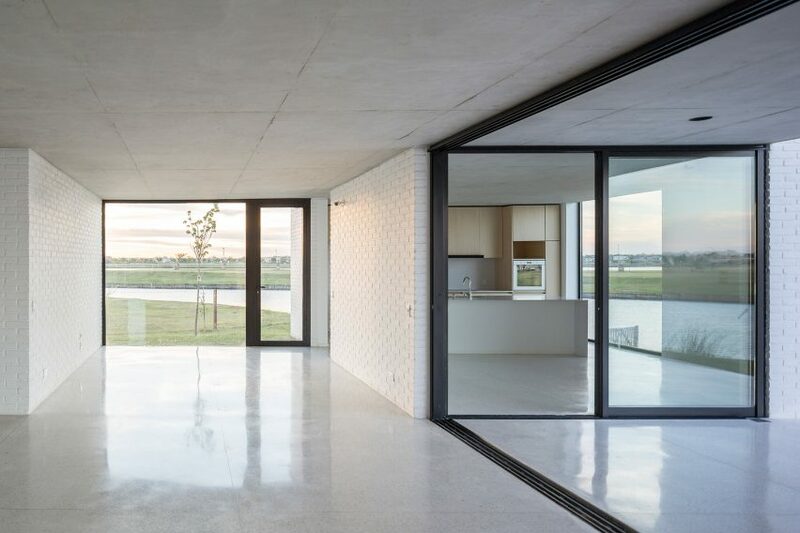 Other homes on the outskirts of Buenos Aires include a linear concrete house by Luciano Kruk that is lined with a reflecting pool, and a brawny residence with walls made of board-marked concrete by Anibal Bizzotto and Diego Cherbenco. Photography is by Fernando Schapochnik.